Portsmouth captains Daniel Jordan, Reese Johnson, and DJ Eley, along with Portsmouth head coach Gene Collins, pose with the certificate of excellence. Coaches and educators often work together to help mold young students and athletes into leaders. You hear coaches praise their players for demonstrating leadership qualities on the field and the court. But, how often do you hear of that extending out of sport and into the community? The Portsmouth Trojans boys basketball team is working to build their leadership qualities, and have helped enhance those attributes by becoming engaged off the hardwood. 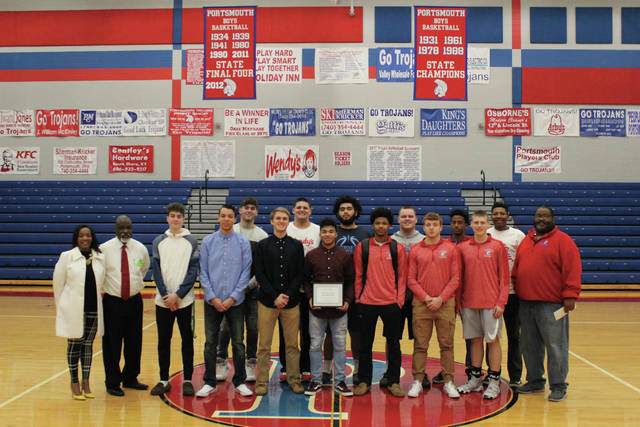 Friday afternoon, the Trojans were presented with a certificate of excellence and a $500 reward from Thomas and Angela Peterson on behalf of Dr. Jean Kerney and K&C Educational Associates in Chillicothe. Portsmouth received the honor for having the most representatives of any school at the Youth Legal Justice Conference in Chillicothe last August. It was a surprise for the Trojans and their head coach Gene Collins, as they were unaware that they would be given the award prior to attending. Senior captains Daniel Jordan, Reese Johnson, and DJ Eley were all engaged in the activities at the conference, absorbing valuable information in the process. It was a trip well worth the time for the teammates, who were able to discover valuable principles of leadership. Those in attendance during the August event were treated to several different presentations, including one from keynote speaker John Darjean who was a former minor league baseball player in addition to being an author and actor. “I liked listening to all the other people’s stories, and what they did throughout life to where they are now,” Eley said about the experience. Collins has watched the trio of seniors become better as players and people during their past four years at Portsmouth. The three Trojans have learned about themselves in their time at Portsmouth, and have used those life lessons to uplift those around them. Each player knows how important it is to be a good role model, especially with younger eyes watching them in awe as spectators. Being someone the younger generation can look up to and appreciate is something very dear to the Trojans captains. Eley shared a similar view to Jordan in that regard. Portsmouth is an area that is constantly dragged down from outsiders in a negative light, but Collins has tried to uplift his team in a positive manner. With so much focus on drugs and the bad aspects of things, the Trojans head coach hopes his team takes a different path, and uses their podium to inspire their peers to do much of the same. Collins has a plethora of experience dealing with the tough parts of life in the tri-state area. Along with his head coach, Jordan knows there are plenty of great kids by his side on the basketball court, and attending school alongside him. Jordan and Johnson are worried about the bigger picture in our communities, but also are focusing their scope in on what they can do to make Portsmouth a better place. Eley agrees that erasing false perceptions about Portsmouth would go a long way. 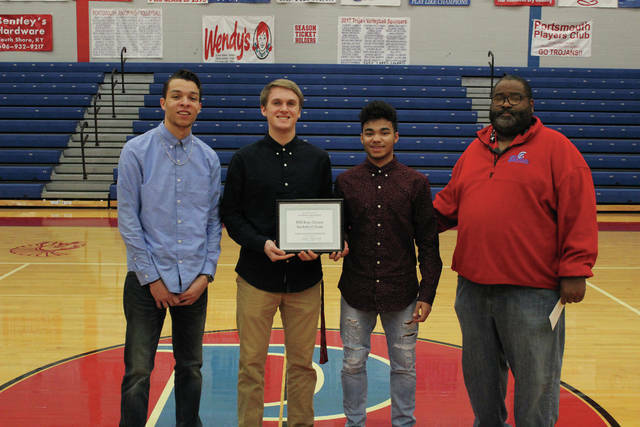 The Trojans have three outstanding leaders on the basketball team, but the leadership extends far beyond the court at Portsmouth High School. Set to make their mark, students at Portsmouth are working hard to achieve their goals and make the community and world a better place. As a school that has continued to cultivate future leaders, the Trojans are trying hard to bring those around them in the city up as well. With a solid core of senior leaders playing basketball as well as attending the school, it looks as though the future is bright for Scioto County.